2010 E-Tropolis Retro. Picture credits - E-Tropolis. Submit more pictures. Back to the future - let�s enjoy it. Our E-Tropolis �Retro� Scooter combines mobility with retro-designed driving pleasure. Comments: Range 70km. Silicon battery, 60V. Charging time 2-8 h. Climbing capacity up to 12%. Ask questions Join the 10 E-Tropolis Retro discussion group or the general E-Tropolis discussion group. Get a list of related motorbikes before you buy this E-Tropolis. Inspect technical data. Look at photos. Read the riders' comments at the bike's discussion group. And check out the moped's reliability, repair costs, etc. 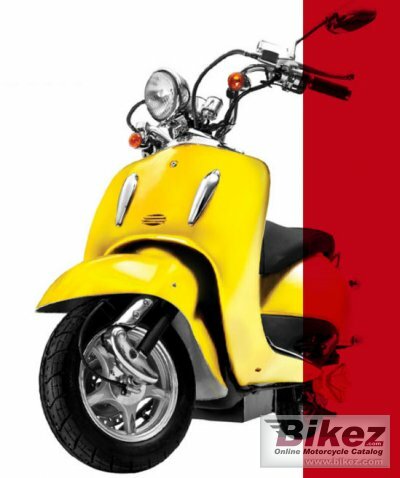 Show any 2010 E-Tropolis Retro for sale on our Bikez.biz Motorcycle Classifieds. You can also sign up for e-mail notification when such mopeds are advertised in the future. And advertise your old MC for sale. Our efficient ads are free. You are also welcome to read and submit motorcycle reviews.